Wasp AE is ideal for persistent intelligence, surveillance, reconnaissance and targeting (ISRT) missions. Image courtesy of AeroVironment, Inc.
Wasp AE is the all-environment derivative of the Wasp III unmanned aircraft system. Image courtesy of AeroVironment, Inc. The Wasp AE UAS is hand-launched in confined areas. 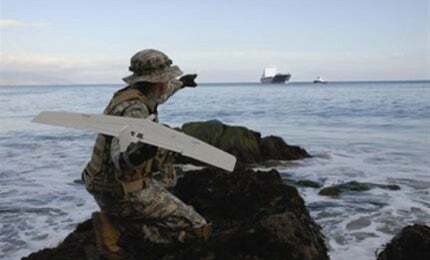 Image courtesy of AeroVironment, Inc.
Wasp AE small unmanned aircraft system (UAS) from AeroVironment is one of the advanced unmanned platforms in the market for maritime and land operations. It is the all-environment variant of the combat-proven Wasp III UAS. The small UAS can perform persistent intelligence, surveillance, reconnaissance and targeting (ISRT) missions. The US Air Force (USAF) placed a $2.5m order for Wasp AE systems under the Battlefield Air Targeting Micro Air Vehicle (BATMAV) programme in May 2012. "The small UAS can perform persistent intelligence, surveillance, reconnaissance and targeting (ISRT) missions." AeroVironment received a $12m contract from the US Army in September 2012 for Wasp AE systems to support the US Marine Corps (USMC) mission requirements. The scope of the contract includes initial spares, training services and logistics support. In September 2014, AeroVironment was awarded a $21.7m firm, fixed-price order by the USMC for RQ-12 Wasp AE small UAVs and initial spares packages. XTEK, on behalf of the Australian Defence Force (ADF), placed an A$7.7m contract for a Wasp AE system in December 2014. The ADF received and started training exercises with the Wasp AE small UAS in June 2015. The rugged and portable UAV is designed for use on ground and water, making it ideal for both land and maritime operations. It offers 20% more flight duration than its predecessor. The Wasp AE utilises spares common to AeroVironment’s other UAVs. The small UAS has a weight of 1.3kg, length of 76cm and wing span of 102cm. The Wasp AE integrates Mantis i22 AE miniature gimballed payload. The payload weighs 270gm and has a ball diameter of 2.5in. It integrates both colour and infrared cameras in a single sensor package. The aerodynamic, modular gimbal houses pan- and tilt-stabilised, electro-optical (EO) daylight 5MP camera and a thermal infrared (IR) 640 x 480 camera. The high-resolution cameras transmit superior imagery in high wind conditions. The Wasp AE is equipped with modern avionics and accurate GPS navigation allowing operation in either manual or pre-programme mode. The UAS has remote launch capability and can also be hand-launched in limited spaces. The UAV is recovered using deep-stall landing method in confined areas on surface or water. The integrated landing camera aboard the Wasp AE provides the operators with superior situational awareness during landing. The power plant of the Wasp AE is equipped with an electric motor powered by rechargeable lithium-ion batteries. The low-acoustic propulsion system avoids detection by hostile forces. The UAV is controlled by a combat-tested ground control system (GCS). The common GCS interfaces with other tactical unmanned aerial vehicles, including Puma, Raven and Shrike VTOL, minimising the training requirements and saving the time and costs involved in the maintenance and operation. The customised autopilot on the UAV integrates a digital data link (DDL), which is interoperable with the GCS of AeroVironment’s other tactical ISR UAVs. The Wasp AE can transmit encrypted communication, voice, video, text and data from a line-of-sight (LOS) range of up to 5km. The DDL aboard the vehicle ensures the relay of data beyond 5km range. The Wasp AE has a cruise speed of 20k and a dash speed of 45k. It can fly at an altitude of 500ft above ground level (AGL). The flight endurance of the UAS is 50min.